This 3 bedroom, 3 bath, air-conditioned condo is beautifully appointed and very comfortable for 6 to sleep, eat, relax and vacation in luxury. King beds in 2 bedrooms and a third with two twin beds. 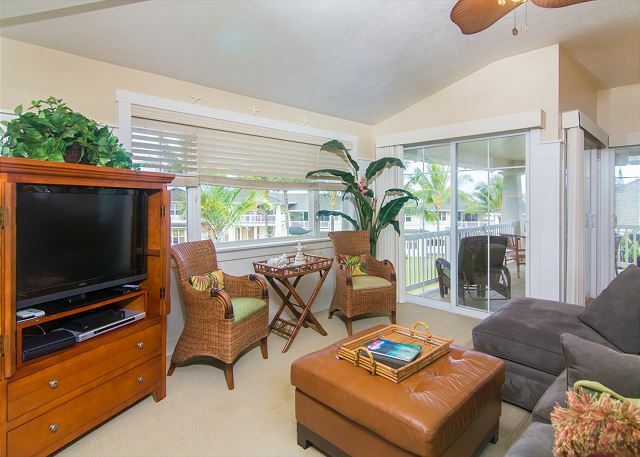 We have a large furnished lanai with pool views, wide screen cable TV in the living room. Hair dryers, full linens and towels including beach towels are all there for you. The washer and dryer as well as a kitchen with the latest in appliances including dishwasher, microwave, coffee maker and toaster make living as easy as if you were home. As a guest at Plantations #1422 & RE/MAX Kauai, you'll have access to Kauai's Premier Concierge Service at (855) 665-2824 http://kauaiva.com/index.html, we will help you build your perfect vacation. We love the Plantation units, this is our second year's stay here. In this unit, the only thing I could suggest is that the master shower curtain needs to be switched out, it was moldy. The condo was just as described and the pictures all matched exactly. It was a nice location with a view of the pool, palm trees, sunrises and sunsets. It was a lot of fun to eat out on the balcony and have visits from birds in the area. We couldn't find any AC in the two smaller bedrooms but the breeze helped. Water pressure was a problem but it was fixed efficiently. Living room furniture is lovely to look at but there is not comfortable seating for four adults (couch is great; two occasional chairs were for looks only). E erythema about the condo is top notch! The location, accommodations and overall experience was excellent! We were so impressed with this condo. It was in a great area, very nice, clean, and with plenty of room for a family of 4 adults. It has everything that you ever needed to stay comfortably including; laundry detergent, dish washing soap, body soap, and even paper products. Though, our dish washer didn't work so I had wash the dishes by hands, which I didn't mind. The super market was just about a mile away, and we had made many trips there. This was our second trip to the island. I would defiantly go back to this place at our next visit to Kauai. Our experience was the most wonderful stay at the Plantations in Princeville, never in a million years it would be such a peaceful and delightful visit to Kauai and have a home pleasantly prepared for all our needs in every way, not one person was disappointed. The conditions were excellent and very clean. Im hoping to come back again in the future.